Battle.net in its day was revolution. It changed the way people were playing games on the net. It brought people together to find game-mates to enjoy the games, compete or even collect ears (Diablo PvP anyone?). Since then a lot has changed. Many similar services were out and many different companies did various things differently. Blizzard though is not someone who can be outgamed on the very game Blizzard invented. The new battle.net offers all the goodies found in its previous incarnation in their classic form(that is about to change) but the whole thing is geared towards a unified way of accounts for all games including World of Warcraft and the upcoming Diablo III and Starcraft II. This of course includes all payment stuff as well(as if Bli$$ard would not include an easy unified way to depart people from their money). Currently the account merging for World of Warcraft is only avaiablle for the north american servers and not for the europeans or the asian servers. I guess its not gonna be long until merging will be available for all. All in all Blizzard has started something that seems that its gonna make our digital gaming life with all Blizzard games a lot easier. I still cannot tell if Blizzard is aiming for something more than that but I would certainly enjoy more features and options. Being able to backup my my game saves, or downloading a ready to run games rather than the installer would certainly help. 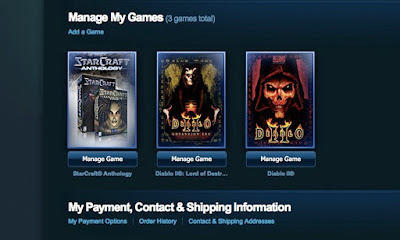 Ok, I admit it, I want Blizzard to create a game management system like steam but better and not involving Valve.